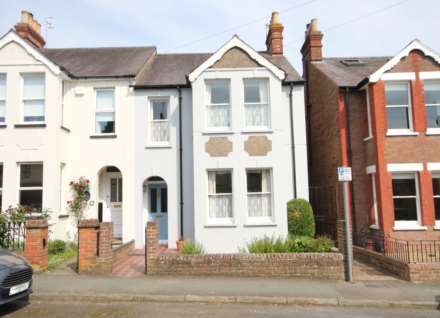 Refurbished and well presented 5 bedroom semi detached character home. Refitted ensuites to 2 Bedrooms. 2 Receptions. Refitted Kitchen/Breakfast Room with granite worksurfaces. Conservatory. 70` landscaped westerly facing rear garden. Large Garage. Convenient for Station. Refurbished and superbly presented 4 bed semi det home with exclusive residential situation. Spacious accommodation of around 2300 sq. feet. Master Bedroom suite. Ensuite Bathroom. Bathroom, roll top bath. Lounge. Sitting Room. Luxury Kitchen/Dining Room. Garage. Westerly facing private garden. Spacious 4 Double Bedroom Detached home, southerly facing rear garden, exclusive situation convenient for the `Village Centre` and railway station. Ensuite Shower Room to Master Bedroom. Family Bathroom. Spacious Lounge/Dining Room. Sitting Room. Refitted Kitchen/Breakfast Room. Solar Panels. Rarely available 5 Bed semi detached home with private and exclusive head of cul de sac situation. Convenient for the `Village` centre and Main Line Railway Station (London Euston 26 minutes). 1st floor Bathroom. Separate Shower Room. 3 Reception Rooms. Fitted Kitchen. Gardens. Period features. A charming character 3 Bed semi detached home retaining a wealth of period features with driveway and located in Boxmoor `Village` overlooking Blackbirds Moor and Boxmoor Cricket Club. Lounge with log burning stove. Dining Room with feature fire. Conservatory. Fitted Kitchen. Bathroom. Garden. Rarely available 4 Bedroom home with landscaped and private 90` approx. rear garden situated in this most sought after cul de sac. Convenient for the `Village` centre and Railway Station. First floor Bathroom. Separate Shower Room. Three Reception Rooms. Refited Kitchen/Breakfast room. Garage. Outstanding Edwardian Semi-Det`Villa` wealth of period features with glorious 170` landscaped gardens and desirable side road situation convenient for the `village` centre and mainline railway station. 3 Bedrooms. Bathroom. Large extended living accommodation. Kitchen/Breakfast Room. Cloakroom. Outstanding 3 Bedroom Detached Property with large extended ground floor accommodation and highly desirable cul-de-sac situation. Scope for the creation of an annexe within the existing ground floor accommodation. Landscaped and delightfully private southerly facing rear garden. NO UPPER CHAIN.